My neighbor showed me how to make something very similar decades ago. But for the life of me I can't remember if it had meat or not. It's been 30 years since I made it. Adding corned beef would certainly make it tasty. When we first moved to Maine we didn't have much money coming in and I was doing anything to earn cash. I had a chainsaw and a local who yarded logs with horses. -30 and colder was common that winter. The night before I would cook up some Ramen and add an egg to it, sort of like egg drop soup, then add whatever leftovers we had for veggies. It would go into a super wide mouth thermos designed for the job. The next day the noodles had soaked up all of the liquid and was something like a casserole, and still hot. At -30 hot food was very important as it gave me someplace to dunk my frozen sandwich to thaw each bite. I pretty much couldn't get enough calories doing that work. Just an aside, felling and limbing trees professionally with a chainsaw is hot and hard work. We'd get to the woodlot all bundled up in layers and after just a few minutes I was down to pants and longjohn top, and I was sweaty and steaming just like the horses. The layers had to come off because one doesn't want the layers to get soaked. When cutting, the next load had to be ready for the team when they got back, so one didn't stop. Stop for more than just a few minutes though, for lunch for instance, or to sharpen the chain, and the layers had to go on again. One doesn't chance the skin or hypothermia at those temp's. I recall when my little brother and I were very young and hungry, our mother would enable us to fill our bellies with strips of pie dough sprinkled with cinnamon and sugar and baked in the oven. My mom did the same thing. They were the cuttings from the edges of the pie, rather than just throw them away. This sounds delicious, but when I read it to SWMBO she cringed and gave me "that over my dead body" look. You must remember, though, that she's from southwest England. I made the Panackelty last night with a few changes. The wife doesn't care for canned corned beef, so I browned some ground beef and used that instead. I'd make it again, yes, it was delicious! Even with the extra step of browning the meat it was still easy to make. No biggie, of course, but just today I had a very nice lunch. Had a 1/4 pound chunk of smoked sausage in the freezer, nuked it for about a minute and wrapped it in a slice of whole wheat bread and some potato chips on the side. Sliced fried potatoes and onions in an overflowing cast iron chicken fryer skillet. My grandmother was the old timey WV cook who taught me. 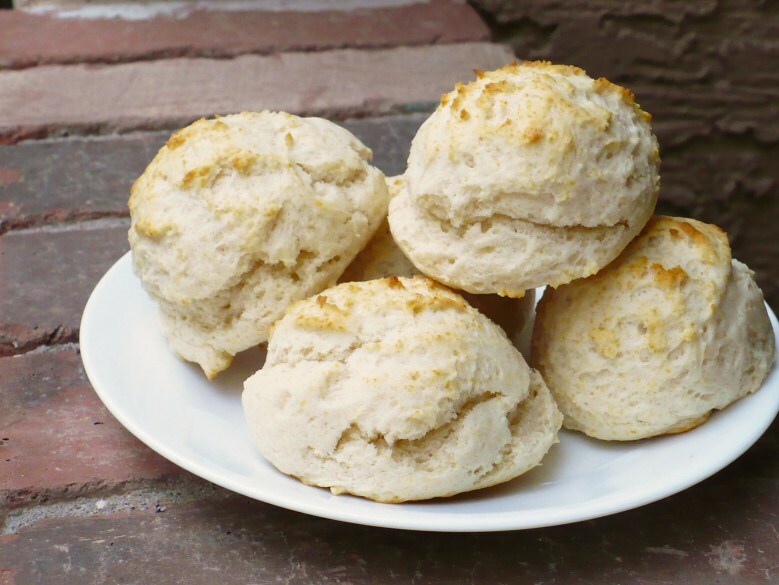 Bisquick drop biscuits with creamed chicken. Boiled beef tongue (which was dirt cheap then but $20.+/lb here) and Saltine crackers. My father's favorite was wilted lettuce. Usually fresh leaf lettuce with hot vinegar, salt, and pepper poured over it. I almost forgot scrapple and corn meal mush, hot or set up and fried. Before my mother passed and was feeling sickly scrapple was a treat that cheered her up. And from the borderlands my mother brought down a recipe for corned beef, onion and mashed potato pie, which is OK hot, but even better eaten cold with a squirt of ketchup on top. These days I substitute candied salmon (the chunky kind of smoked salmon, usually comes dressed with maple syrup or black pepper) fo the corned beef since the boss doesn't eat meat. Oddly, that's better hot, and with some good soft shortcrust pastry around it, it is a delicious dish. Don't use a bought pastry shell for this - it's worth the effort of making the pastry yourself and this is the one dish that I bother to do it properly. For tarts and quiches I generally cheat and make a mix-in-the-pie-dish kind of pastry that comes out like a bought shell (too short and crunchy), but without the animal fats that make our boughten shells verboten in this household. Next time I make it I'll take some pics and put it up here.